0.43" x 0.84" x 2.24"
Cons: No light to indicate transferring happening or flash drive is connected ( working). Other Thoughts: Buy it, huuge memory. Other Thoughts: I have used this large capacity flash drive for over 6 months now, and it has worked flawlessly. I have used 90% of its data space, and there have been no issues, lost data, and it has worked on every computer I plugged it into, including USB 2.0 ports. I have owned many other flash drives, and they were all eventually too small! 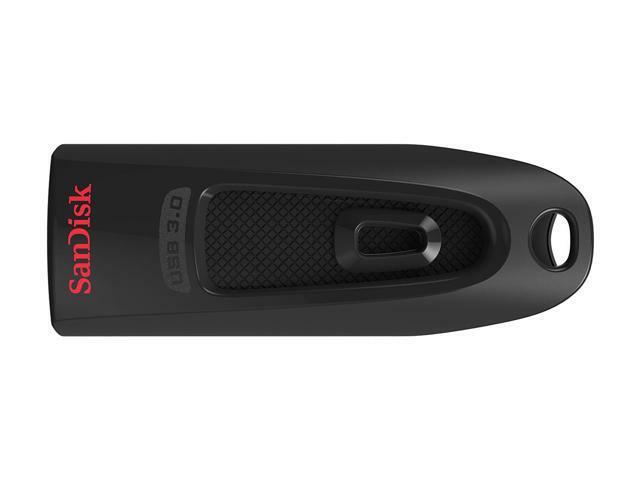 Pros: I've always favored the SanDisk Cruzer drives. Never had any problems. This drive seems as fast as some of the more expensive counterparts that I've tried and the construction is very good. Cons: Very slow. When attempting to transfer large (10's of GB) files, it quickly slows down to about 10MB/s transfer speed. Using the same port & PC, my other large USB flash drive (a Corsair) transferring the same files sustains a speed of well over 100MB/s. Pros: None. Well does look nice, but too light for a paperweight. Cons: Very, very slow speed. Other Thoughts: I would not purchase again or recommend. This by far the worst SanDisk product I have ever bought. 7 out of 19 people found this review helpful. Did you? Pros: 5 Eggs for being well made and having pretty good Read speed. See Other Thoughts below regarding the product description and performance. Cons: Careful reading of Overview, Footnotes, and Specifications reveals limited claim of Write speed. If you just read the main description at the top of the page here you might think it's a fast all-round performer which it is not! Why not give it a Lifetime warranty if it's such a good product? Other Thoughts: Caveat emptor all over again. Careful reading of the footnotes reveals that Write speed is "up to" 10X that of a USB 2.0 drive (4.0MB/sec.). So, the maximum Write speed under perfect conditions and the most favorable measurement MAY reach 40MB/sec. In practice when you're Writing a mixture of videos, photos, music, documents, etc. you'll probably average between 4MB/sec. and 20MB/sec. You might transfer a single large video file (sequential Write) a bit faster. It may be fine for many users and may last for years, but it's NOT a true high-performance flash drive. For that, please look at the Sandisk Extreme and be prepared to spend more! 14 out of 17 people found this review helpful. Did you?